Although ticket sales for the opening day of the second Test have improved since yesterday's figure of 3000, Chester-le-Street won't be bursting at the seams when the action starts on Thursday. The punters are clearly beginning to pick and choose which matches they attend and, if Chris Gayle's comments are anything to go by, some players will soon be following a similar path. His interview with a UK national newspaper has set another warning light flashing about the future and primacy of Test cricket. Although he attempted to downgrade his view that he "wouldn't be so sad" if Tests vanished in favour of Twenty20s, by saying his comments were meant from his personal point of view, it is another damaging blow for a sport that is battling to maintain a relevance. The fact that Gayle has had to leave his IPL deal to play in cold, early-season English conditions, in a Test series shoe-horned into the calender, has clearly not gone down well, despite his latest effort to convince otherwise. "I'm happy to be here right now to try and retain the trophy," a rather weary-looking Gayle said as he responded to his comments. He claimed the interview in The Guardian had been "misquoted and misinterpreted" which is the usual response from a sportsman who wants to back himself out of a corner. However, he didn't try to alter his comments, rather just clarify that he was talking about himself and not Test cricket as a whole. "I don't see myself playing Tests for any long period of time, but I think Test cricket will always be there. Twenty20 has come on board and it's made a huge impact on the world, it's brilliant, games have been sold out and it has taken the place by storm. I look at Test cricket differently, I don't see it as long term for me, just for me, I'm just speaking about myself." What should come as a concern for those running the game and trying to cram in endless international fixtures to justify television deals is Gayle's reasoning. "There's a lot of cricket being played and I've started to develop a lot of injuries," he said. "It takes a toll on your body and your mental strength so at some stage you aren't going to go on forever. You have to choose what you are going to do as a person. "It's something I've discussed before, maybe not in the media, but I've talked to friends and players about it. It's not like I've just thought about it overnight." However, as one of nine current Test captains in the world game, Gayle needs to remember that his role goes beyond the personal. It shouldn't just be about the here and now for him, but also the bigger picture. Not everyone is going to make it as a millionaire Twenty20 star and Gayle, as one of the most flamboyant batsman of his generation, should be able to play a role in promoting the five-day game. Andrew Strauss is one such player who is likely to miss the Twenty20 revolution and made comments before the Lord's Test that he wouldn't allow an England player to arrive 48 hours before a match. Gayle hit back in the newspaper interview, but tried to ease any potential tensions by saying no disrespect was meant. "There's a lot of cricket being played and I've started to develop a lot of injuries. It takes a toll on your body and your mental strength so at some stage you aren't going to go on forever. You have to choose what you are going to do as a person." "It wasn't his concern," Gayle said. "I respect Strauss, I would never have any conflict with him. I just find it a bit strange that he touched on that sort of point and he should leave it alone. "Maybe he's under a lot of pressure. The Ashes series is huge. "Maybe he tried to put the pressure on me to try to take a bit of pressure off him. I have respect for Strauss it's not like I'm trying to degrade him, I would never do that. Sometimes you just have to stand up for your rights." Strauss maintained there were no tensions and suggested that any problems the West Indies captain had were not his problem, but admitted he had concerns about the health of Test cricket. "We haven't been sitting in the bar telling tales of our lives but our relationship has been pretty good. I've had no problems with him up until now. If he is uncomfortable with what's gone on in the last couple of weeks that's an issue for him rather than myself. "It [Test cricket] is under pressure," he added. "I think it is important we play good Test cricket to make people aware of what a good format it is and how entertaining it can be. It's the only game that really tests out your temperament, your technique, your hunger, your bravery, all those aspects of the game." That seems an opportune moment to bring this back to the actual game; a Test match, the ultimate format. West Indies' game fell away so rapidly at Lord's that it was difficult to recognise the team that fought so hard in the Caribbean. Now with Gayle's comments ringing in their ears it's hardly the motivational stand they needed from their captain. "The guys know the situation. It won't affect us, we are all big men," he said. 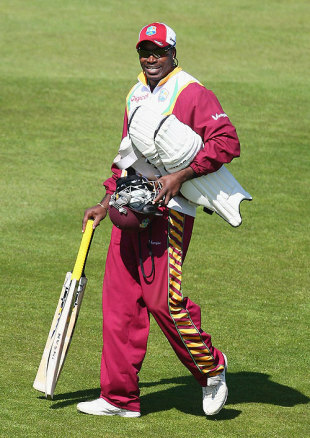 Strauss, however, was hoping the furore will take Gayle's mind off the serious matter in hand. "He is always dangerous. He always plays the same way, hopefully he'll be slightly distracted tomorrow." Gayle clearly won't be playing Test cricket much longer, although he laughed off the idea that this would be his final game. He said he still had a job to do in rebuilding this West Indies side and now would be a good time to show he really means it. At the moment Gayle's opinions appear the minority view, but the game needs to work out what it wants to be in the future. If players don't want to play, and people don't want to watch, then there really is trouble ahead.